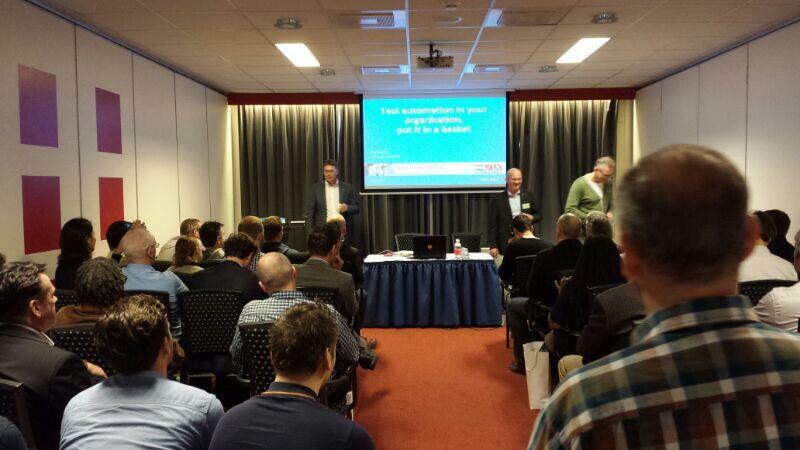 Yesterday the Dutch testing conference was held. I spoke with a lot of people, got some new ideas and exchanged experiences. My Colleague Egbert Bouman was nominated for the DTC excellence award and I got to do a nice presentation wit Ard Kramer. The room was full, with people standing in the back. But they kept smiling throughout the presentation. Ard and I discussed the approach we took in implementing Test Automation at Delta Lloyd. Earlier that day I heard a test-expert claim to have a wide experience in test automation. He referred to various tools and test types he had been involved in. A nice contrast, because in our presentation we conclude that for the successful implementation, we reduced our focus on the tools. Rather than discussing tool selections, whether to use Selenium of QTP. We learned to have a lean process and got more eye for the people instead…they determine the success in great extend. This entry was posted in Conferences, Experience report, Slides, Test Automation and tagged ard kramer, bridging the gap, business value, delta lloyd, dtc2014, dutch testing conference, Egbert Bouman, heliview, hpqc, implementation strategy, presentation, qtp, selenium, software testing, Test Automation, test improvement, Valori, virtualisation. Bookmark the permalink.